Much Ado About Nothing, Gray’s Inn Hall. Review by Julia Pascal. This is Shakespeare light. Very light. Antic Disposition’s presentation of Shakespeare’s 1598 comedy is aimed at touring in South West France during the summer months when Paris empties and the French take to the countryside. The performance, with a cast of musically talented French, English and Belgian performers, is set in newly-liberated France. Music, costumes and the invention of the French restaurant situate the action in 1945. It is a selective vision. Here there is no sign of the shooting of Nazi collaborators nor of women with shaved heads accused of horizontal collaboration. Directors Ben Horslen and John Riseboro have placed the comedy’s action within a simple French provincial restaurant setting. Tablecloths are red and white gingham and the dish of the day is cassoulet. They have invented a head waiter who is a mixture of Jacques Tati and Basil Fawlty. He is played with great bravura by Louis Bernard. This martinet castigates his idle staff in French as a warm up for the audience. So far so un-Shakespearian. Into this provincial backwater enters an army of British soldiers who fall in love with the local women. It is a harmless concept and meant to charm. Antic Disposition creates productions to be seen in spaces that are not traditional theatres. 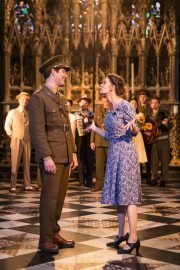 Its London presentation of Much Ado About Nothing takes place in the magnificent Gray’s Inn Hall. This beautiful structure which originates from 1388 was a refectory for students. As a playing space however its acoustics are tough. Comedy requires a flat-on presentation and therefore the production has to work hard for the visual gags to work in a traverse layout. Some of the performers do not have the technique required to overcome this and often text is lost. Those who unite delicate performance with clarity and vocal strength are Floriane Andersen as Hero, Chiraz Aich as Beatrice, Alfie Webster as Don John, Alexander Varey as Claudio, Tommy Burgess as Borachio and Nicholas Osmond as Benedick. Each projects well and overcomes the handicap of the setting. There are areas of deliberately crude acting and pantomime. The audience were entranced and all was very merry. Anyone looking for a deeper reading of this dark comedy should stay away.